The following parable illustrates that how you handle money at age nine is shockingly similar to how you'll handle money at age 32. Similarly, collegiate allegiances at age nine may continue throughout adulthood. Raise your children accordingly. When I was in third grade, my teacher used play money as a behavior reward system. I don't really recall how dollars were earned - I assume sitting quietly, answering questions, getting good grades, and not picking your nose. You know, the usual behaviors you'd like to encourage. But I don't really remember for sure. I do, however, remember that we got to spend these rewards at an auction. I'm going to guess we had an auction every month, though they could have been weekly or semi-monthly. I used semi-monthly instead of biweekly there to avoid the confusion that always comes with the term biweekly. "Did he mean twice a week or every two weeks?" While it's not technically exactly the same as every two weeks, semi-monthly avoids that awkward uncertainty by making it clear that I meant twice a month. Coincidentally, at work I'm also paid on a semi-monthly schedule, and my goodness I seem to have digressed. As I was saying, periodically our teacher held an auction to allow us to spend our fake money. The auctions mostly featured your standard kid's junk. Little green army men, an etch-a-sketch, a Mr. Potato Head. That's right, I just named the first three random items I could think of from Toy Story. I'm going to guess each of these things went for somewhere in the neighborhood of $100 to $500 of these classroom dollars. I'm sure I bought something from time to time at these auctions, but I've always been a saver. Even in the third grade. So most of the time, I just sat there and watched other people bid while my wealth accumulated. Side note, these were true auctions where the free market spoke. Not like the kids these days who just mosey on up to the treasure box one at a time and purchase something at a fixed price, removing all power from the consumers. That's what we in the business world call a monopoly. Or, as Sheriff Buford T. Justice would call it, "pure and simple, old fashioned Communism." Anyway, at some point during the year - I'm going to guess fall, based on the item in question - my days of saving finally paid off. Up from behind my teacher's desk came the next item up for bid... a porcelain Carolina football player. Finally. Something worth bidding on. I have no recollection of whether I screamed out the entire amount of money that I had at that time or if I slowly outlasted everyone else or if someone else placed a bid and I immediately doubled their offer, but when the auction had ended, I had spent $2,000 on this little beauty. I'm calling this item porcelain, but I have no idea if that's really accurate. It's not plastic or metal and, if dropped on a hard surface, it would definitely break. So porcelain seems like a safe description. It's about 11" tall and appears to be hand painted. Like maybe someone bought a little gray replica of a football player and then painted the Carolina uniform, helmet, etc. Despite having owned this for almost a quarter of a century, it wasn't until inspecting it just now that I noticed that the bottom of the feet have "1974. To: Boo. From: Boo." etched into them. A brief Google search yielded no results regarding who wore #77 in 1974. (Editor's note: It was sophomore defensive tackle Randy Hobbs.) A brief thought exercise yielded no results as to why Boo would give Boo a gift. The definition of relic is "an object surviving from an earlier time, especially one of historical or sentimental interest." 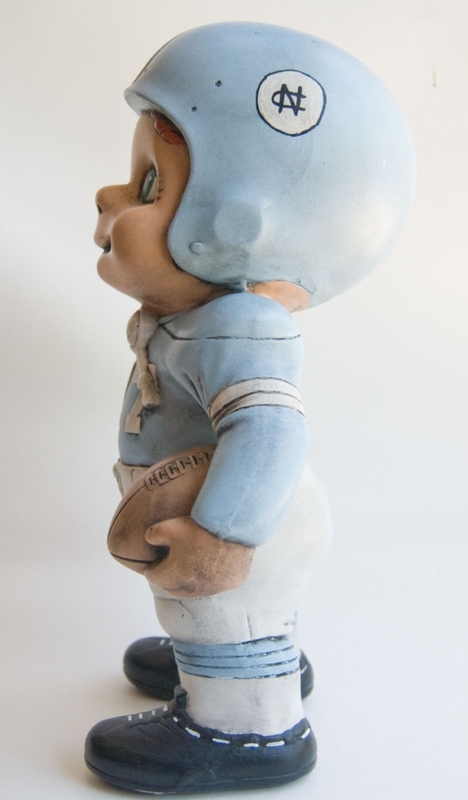 That's how I'd describe this porcelain #77 football player - old, but only really sentimental to my household. And to some degree that's how I'd describe Choo Choo Justice. He's probably the only Carolina football player from prior to 1950 or 1960 that is a household name, but because he finished as a Heisman runner-up for two straight years and as a Heisman winner in no years, he's pretty much only truly known or remembered fondly in Tar Heel households, not the general college football public. David Staley spins a road trip tale. David Staley writes of family connections and a prized poster. David Staley on another Carolina keepsake.